A star studded, exclusive red carpet even brought together Nollywood’s finest and Silicon Valley Geeks on Tuesday 21st March at the Filmhouse IMAX cinemas in Lekki, Lagos, Nigeria. The event dubbed Geeks Meet Nollywood was one of the highlights of a 3-day tour of Silicon Valley entrepreneurs on Geeks On A Plane (GOAP). The Lagos tour was facilitated by the African Technology Foundation and 500Startups, to showcase Lagos, as a vibrant technology and creative hub for Africa, with latent investment potential. The event was organized by Stephen Ozoigbo, CEO of the African Technology Foundation in partnership with Chioma Ude the founder of Africa International Film Festival, AFRIFF and hosted by Kene Mkparu, the Chairman and CEO of Filmhouse Cinemas. Next on the agenda, was a mini-symposium and deep-dive into the local entertainment industry’s achievements and challenges, held within the spacious foyer of the IMAX Cinema. Kene Mkparu, kicked this knowledge-sharing segment off, by sharing the successes and numbers behind IMAX and 2016’s best Nollywood blockbusters, such as the Wedding Party. He also announced their new Television Viewing On Demand (TVOD) platform launching soon that will allow Nigerians to enjoy the cinema-experience on mobile. Chioma Ude asserted the important role that industry enablers such as AFRIFF, play in driving content, and creating greater opportunities for creatives to collaborate and share work. The night was also about the exclusive African premiere of VENTURE: An Entrepreneur’s Journey. After the symposiums, the industry stakeholders and press filled the Premiere One movie theatre, to watch the documentary, directed by Ejiro Onabrakpor, and co-produced by the African Technology Foundation and LIONS@FRICA initiative. The documentary follows the unique entrepreneurial journeys of four top African technology start-up founders – from winning the DEMO Africa Launchpad in 2015, to attending President Obama’s Global Entrepreneurship Summit in 2016. After beating a pool of over 600-startups across the continent, to reach the final list of 30, these four startups emerged winners and were awarded the opportunity of a lifetime – a week-long trip to the Silicon Valley for the LIONS Innovation Tour. The principal subjects of the documentary each represent the most important and diverse aspects of the African entrepreneurial ecosystem, in their endeavor to effect change and meet the needs of a billion people across the continent. Kelechi Anyadiegwu is a young woman of Nigerian heritage who grew up in New Jersey. Her startup, Zuvaa, is an exciting online community and marketplace for African-inspired fashion. Bayo Balogun, a native Nigerian who spent the latter years of his adult life working as a technology consultant and entrepreneur in North Carolina, is the founder of Car Parts Nigeria, a search engine aggregator that helps Nigerians find location-specific auto parts and auto service technicians. The third entrepreneur, Gagan Hayer, a native of Bombay, India and a resident of Nairobi, Kenya, founded his startup, InsureAfrika, as a digital platform that allows people to aggregate insurance quotes and purchase a variety of insurance products online. The fourth entrepreneur Karogi Kamau, is a native Kenyan whose startup, BambaPOS, allows retail merchants access point-of-sale and inventory management automation with any smart device. The winners attended the Global Entrepreneurship Summit in 2016 and were inspired by President Obama’s charge for a better future, through entrepreneurship. 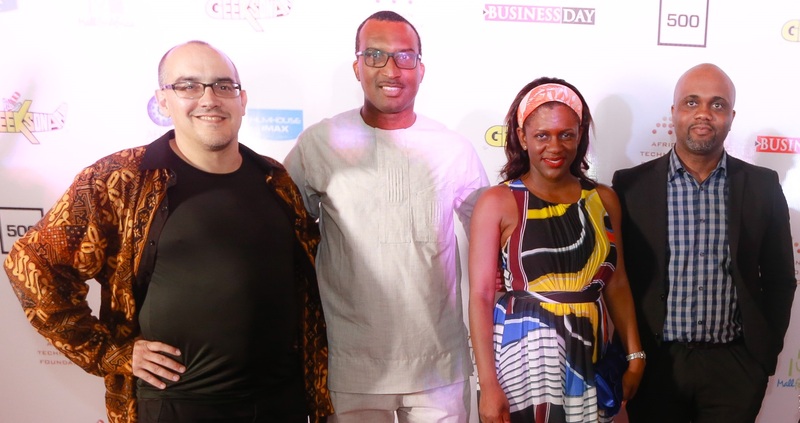 After the screening, networking continued and the event ended on an optimistic note with future investments and collaborations, hinted at, by the Geeks and Nollywood’s stakeholders.